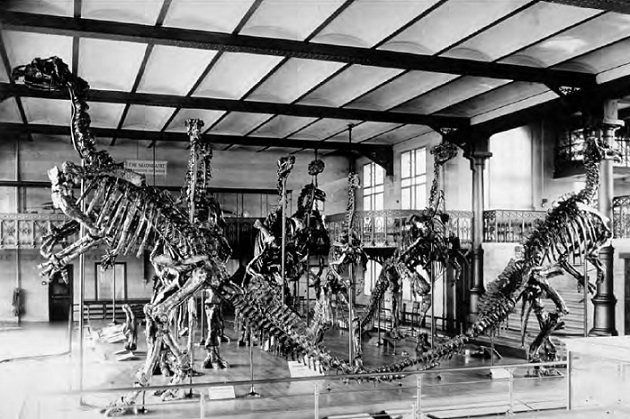 On this day in dinosaurs, two Belgian miners discovered a treasure trove of fossils in Bernissart. Starting with bones and teeth, the miners began uncovering more of the buried bones. When the Natural History Museum in Brussels was notified, scientists there identified the bones as belonging to Gideon Mantell’s Iguanodon. As the work continued, researchers found complete skeletons in life position. These remarkable discoveries were far more substantial than any of the English dinosaurs. Finally, the world knew what Iguanodon looked like anatomically. Each skeleton was carefully graphed in position, sketched, and packed in plaster of Paris for transport to the museum. Many of the skeletons are still on display today. 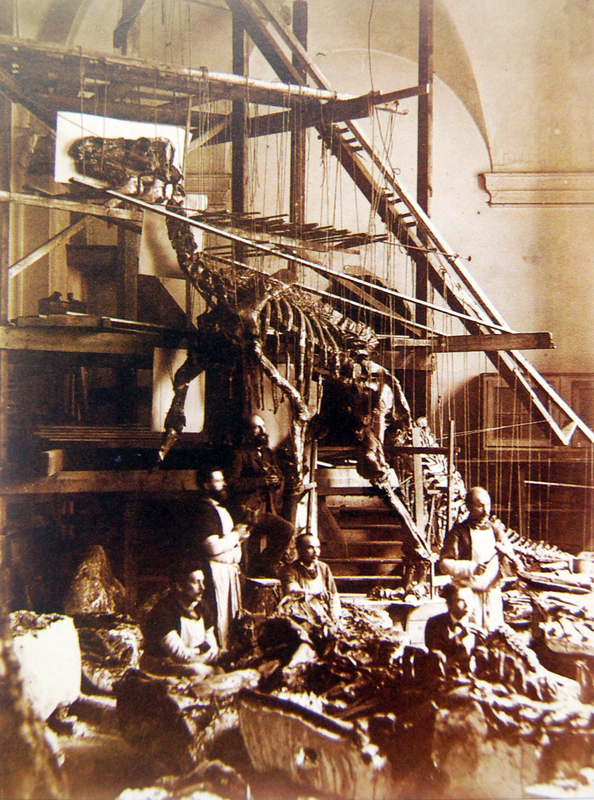 By 1879, 14 Iguanodons had been recovered from Bernissart. Louis Dollo was in charge of studying them and mounting them for display. He imagined them as reptilian kangaroos, perched on their hind limbs and tails (we now know they were more quadrupedal, though could have reared up on their hind legs). Dollo’s mounts still stand today in Brussels. Also on this day in dinosaurs, one of the Nintendo 64 console’s most popular games was released. 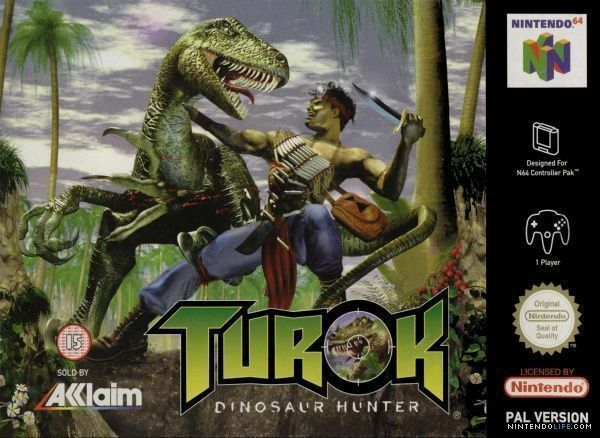 This first-person shooter game featured the comic book character Turok setting off on adventures and shooting at attacking dinosaurs in the process. Share your favorite Turok and Iguanodon photos with us on Facebook and Twitter using the hashtag #TDIDinos. It was David Attenborough’s first landmark series. Life on Earth was more than a nature documentary. It was a groundbreaking visual feast, and some still argue it’s the greatest natural history series ever made. The show’s seventh episode–Victors of the Dry Land–featured the rise of reptiles and debuted on this day in dinosaurs in 1979. This episode included an extended segment about everyone’s favorite Mesozoic giants. 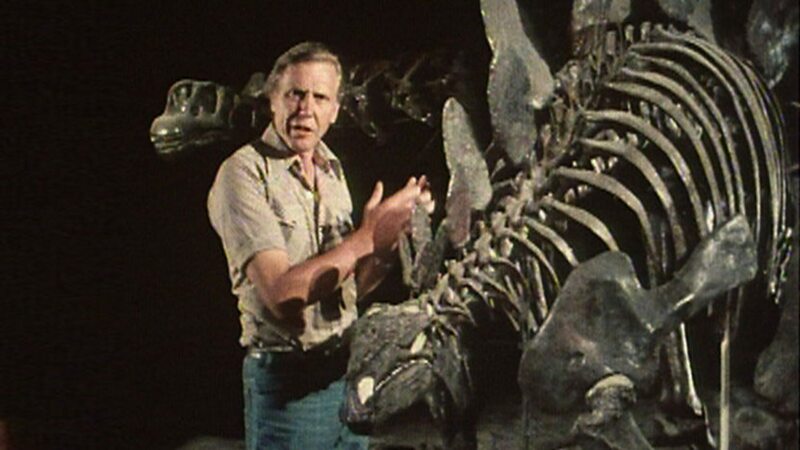 The science and the graphics are far removed from our modern understanding, but the segment represents one of the first television spotlights on dinosaurs. Share your favorite David Attenborough meeting dinosaur moments with us on Facebook and Twitter using the hashtag #TDIDinos. You can learn a surprising amount of information from an animal’s teeth, and dinosaurs are no different. 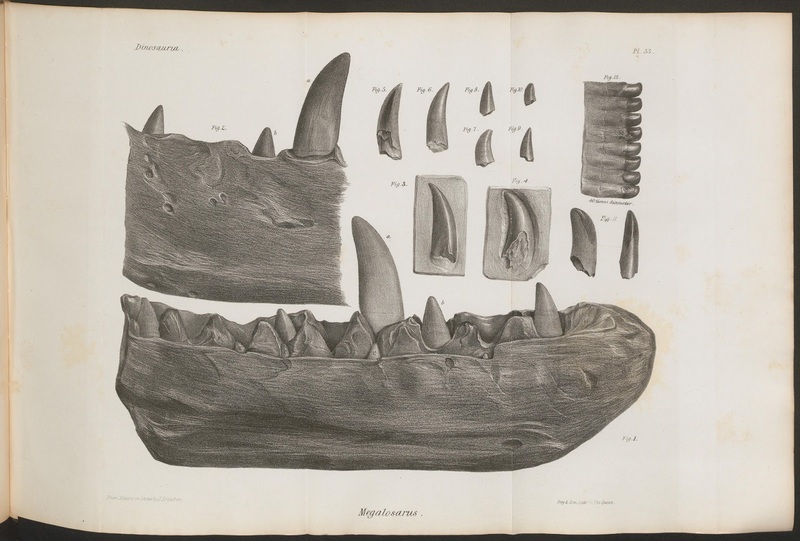 As we’ve already seen, Gideon Mantell and William Buckland described Iguanodon (which you’ll remember means “iguana tooth”) and Megalosaurus based largely on their teeth. Chompers are tough and are among the most likely of an animal’s skeletal elements to be fossilized. Teeth can provide insight into a dinosaur’s diet. Obviously, the pointy ones are for meat. But differently shaped teeth can provide more subtle clues. Allosaurus had thinner, more sword-like teeth than Tyrannosaurus with its round, railroad spikes. Allosaurus teeth cut meat from bone, while T. rex crushed bone. Still more different, Spinosaurus carried conical teeth in its jaws–the same kind of teeth employed in today’s fish-eating animals. The same thinking can be applied to other dinosaurs. The pesky business of whether Apatosaurus and Brontosaurus are two different species is partially based on their peg-like teeth. After recent skeletal studies indicated that skeletal elements differed between the two, special care was taken to examine the teeth. Researchers have indicated that Apatosaurus teeth are one-third skinner than those of Brontosaurus, and look a bit different, too. Even though Apatosaurus is larger, it was dining on more delicate vegetation. Unlike us, dinosaurs continually regrew their teeth throughout their lives. Some had batteries of hundreds of vegetation shears, while others were content with just a few small nippers. But whatever their habits, dinosaurs and their teeth continue to gnaw at our imaginations. Share photos of your favorite dinosaurs and their teeth with us on Facebook and Twitter using the hashtag #TDIDinos. On this day in dinosaurs, we wish Téa Leoni a very happy birthday! Leoni is best known among dinophiles for her role as Amanda Kirby in Jurassic Park III. We hope there are significantly fewer dinosaurs chasing after you today, Téa! Share your favorite Jurassic Park III moments with us on Facebook and Twitter using the hashtag #TDIDinos. We’re naturally fascinated by the terminal–the end. Extinction seems like the ultimate end. Not only does an individual perish but an species disappears. We know that things ‘die out’ but extinction is not a concept many people spend much time thinking about. In fact, up until the dawn of the 19th century, no one thought a complete disappearance of a species was possible. In 1796, Georges Cuvier–a brilliant French anatomist–was studying living and fossil elephants when he began to conclude that some fossil species no longer roamed the earth. Elephants are so large they’d be difficult to hide, Cuvier reasoned. Comparing the bones, he was sure that some types had gone extinct. And further discoveries of strange prehistoric animals confirmed his idea. We now know that extinction is commonplace. Almost every species that ever lived is now gone. Our contemporaries on this planet are just the latest in a long line of lifeforms. Most of them will survive for only a million years, maybe two. Really successful species might make 10 million years. So the background extinction rate, as scientists call it, is slowly ticking away–established species vanishing and new species taking their place. But this rate is usually rather low and operating in millennia. The overall changes to the biota are gradual, yet on a more precise species or family level, we see punctuated equilibrium: rapid changes happening as species mix with each other, diseases are spread, or new territories are colonized. This punctuated equilibrium can happen on a much larger scale. These are mass extinctions, where 75% of Earth’s species are exterminated very quickly. The extinction of the dinosaurs at the end of the Cretaceous period, 66 million years ago, is the most famous of these. But many people do not realize that the Cretaceous extinction event is one of five such events from the distant past. The Ordovician ended 444 million years ago. When it did, 86% of species alive at that time were lost. An ice age altered sea levels, CO2 was pulled from the atmosphere, and temperatures plummeted. The trilobites–one of life’s biggest success stories–were exterminated 375 million years ago at the end of the Devonian. 75% of species disappeared. The likely cause is the newly evolved terrestrial plant life releasing nutrients into rivers and oceans, causing algal blooms. The lack of oxygen choked the trilobites and other marine species out of existence. Sound terrible? It’s not nearly as bad as The Great Dying at the end of the Permian, 251 million years ago. 96% of species were exterminated. 96%. How did it happen? Volcanic activity released extreme amounts of CO2 into the atmosphere. Bacteria fed off this, producing increasing amounts of methane–another greenhouse gas. Temperatures spiked, causing ocean acidification and the complete extermination of tabulate coral reefs (modern corals are altogether differently descended). Ocean acidification, greenhouse gas buildup…sound familiar? Another mass extinction happened 200 million years ago, at the end of the Triassic period. We are not sure how this catastrophe occurred, but we know it took 80% of species with it. This dramatic event allowed the dinosaurs to rise to prominence, only for their own dynasty (of many, many species coming and going throughout the next 130 million years) to be wiped out by asteroid impact 66 million years ago. More than the dinosaurs were lost though. 76% of species vanished with them due to a mixture of extraterrestrial impact, its aftermath, volcanic activity, changing ecosystems, and a slew of other interconnected causes that we’re only beginning to unravel. We humans are living through–and causing–the sixth mass extinction. Greenhouse gases are escalating temperatures. Oceans are acidifying. We don’t have the final dismal tally of how many species will be wiped out, but we know the causes. Our activity has pushed natural systems into overdrive. It is our responsibility to act accordingly when planning the future of our planet–for the moment, our only available home. Share your thoughts on extinction and your favorite photos of extinct creatures with us on Facebook and Twitter using the hashtag #TDIDinos. In 1994, two partial skeletons dating back 110 million years were discovered in Utah. Three years later, paleontologists realized the skeletons belonged to a new species of animal. 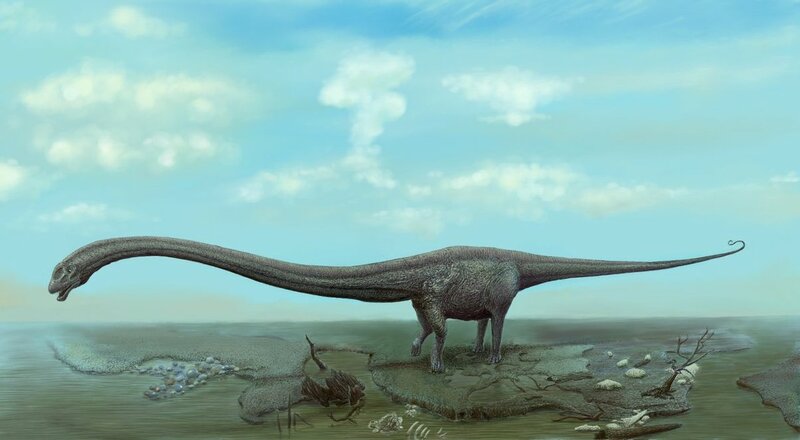 This new long-necked sauropod dinosaur had the largest leg muscles ever known in the family. Whether these muscular limbs were used for walking over difficult terrain or for kicking predators, the scientists dubbed the new dinosaur “Brontomerus,” or “thunder thighs” in 2011. With less than half of Brontomerus discovered, and none of the leg bones, it’s difficult to say exactly what so much muscular strength was doing attached to the animal’s scapula and other skeletal elements. 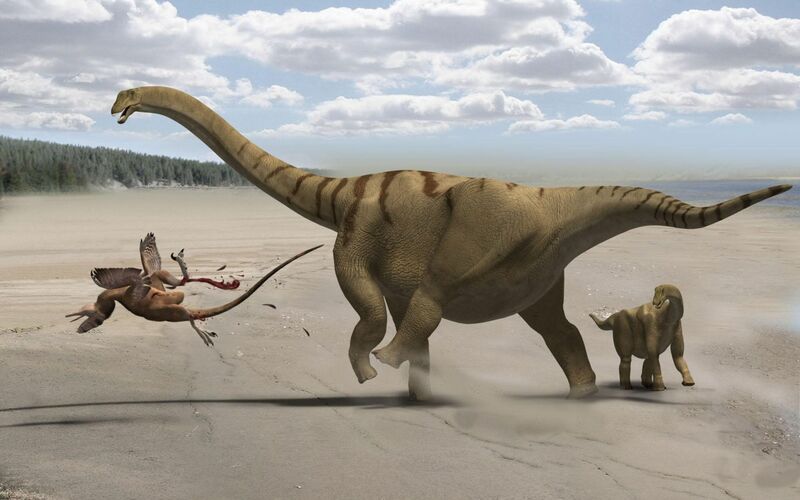 What does seem certain is that sauropods were not simply large, blundering hunks of meat. They were dynamic and stood their ground against fearsome predators. Brontomerus, it seems, did not suffer predatory behavior kindly. Share your favorite pictures of Brontomerus and other sauropods on Facebook and Twitter using the hashtag #TDIDinos. If you want blockbusting dinosaurs (literally), the long-necked sauropods are the record holders. They’re the largest terrestrial creatures that have ever lived–some exceeding 100 feet in length and weighing nearly 100 tons. When dinosaurs come to mind, it’s often the long-necked variety that springs to life in our imaginations. Sauropod means “lizard foot” because early dinosaur hunters thought that the feet of sauropods had splayed digits like those of lizards. They also thought the animals were so big that they must have been amphibious, using water to support their immense weight. Now, with the help of additional skeletons collected over the past century, we know that sauropod feet were bundled together (similar to those of elephants) and that the big bruisers lived on land, not in water (the water pressure would caused significant anatomical problems). The sauropods diversified into several families and spread around the world. Some used their tails as whips which may have produced thunder-crack sound effects, and others may have used their tails as weapons. Their long necks allowed them to feed without moving their huge bulky bodies around. Some must have grazed treetops but many grazed along the ground. But biological eccentricities do not equate to worldwide popularity. How did sauropods manage that? Scale. The sauropods are monsters, but seemingly benevolent denizens of the ancient past. The image of gentle giants that completely dwarf humanity is an exhilarating and reassuring thought. Perhaps nature doesn’t produce land-dwelling animals that exist at such enormous lengths today, but the long-necked dinosaurs are one of the most awe-inspiring groups of majestic Mesozoic rulers. Tell us why you love sauropods and post pictures with your favorite long-necked superstars on Facebook and Twitter using the hashtag #TDIDinos.